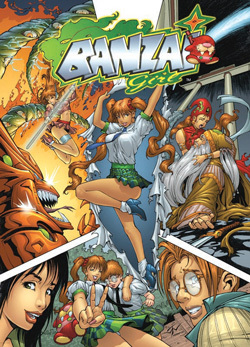 BANZAI GIRL's Jinky Coronado is a girl of three worlds; she just doesn't know it yet. Her nightmares of being both a Princess and a Future Freedom Fighter collide with her real-life as an Asian schoolgirl. Where her biggest obstacles should be homework, boys, and her Dad's new girlfriend, she is thrust into a world of monsters and madness. An alien invasion possessing her town's parents! Strange creatures known as the Duwende, the Kapre`, the Tikbalang, and the Manananggal! A schoolgirl-eating snake creature hidden beneath a shopping mall! Jinky becoming a model and recording star! And much more! And best of all -- it's created and based in part on the real life of Jinky Coronado! Imagine being a girl born on a tropical island...a 12-time beauty contest winner...a two-time parade queen...an FHM lingerie and bikini model...a pop recording artist...an international traveler....illustrator of a best-selling graphic novel series (Meg Cabot's Avalon High)...and one of the hottest female writer/artists in the history of the comic book biz! That's JINKY CORONADO, the creator, writer, and artist of BANZAI GIRL! Now living in beautiful Orlando, Florida, Jinky was born and reared in Iloilo, Philippines. Her BANZAI GIRL series is a bubbly, delightful concoction of her real-life teenage experiences thrown in a blender with her family, her friends, and the Filipino myths and legends she grew up with. 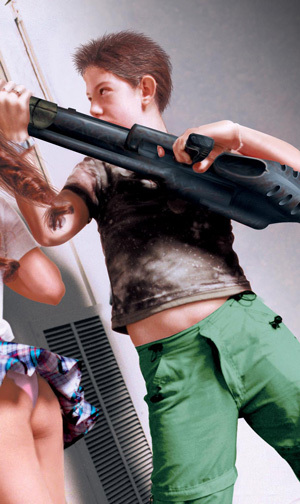 One thing's for sure: Real-life school dress codes were never like this! Just as she turns 18, lovely schoolgirl Jinky Coronado's life takes a left turn into weird. First, her father starts dating. Then, she has recurring dreams of herself living two very different lives. Then she discovers her friends' parents are becoming possessed. And that's all before classmates start disappearing and she learns all the horrors she grew up hearing about -- bizarre, terrifying creatures and monsters of myth -- are real! Boastful beauty queen and fellow classmate Michelle Bebot is a rival who becomes a best friend as their adventures unfold. With her looks and lovely voice, watch her become a pop superstar and find romance waiting in the wings! Jinky's America best friend who has come to live in this foreign land with her mom Judith -- who is a cartoonist whose popular KATIE'S WORLD strip is as big a phenomenon as Garfield or Hello Kitty. The strip is based on Katie J. as a kid -- and Katie hates, hates, HATES it! Full of piss and vinegar with more than a few anger issues, Katie's career track is one of big guns and bigger adventures! This newspaper strip is an integral part of BANZAI GIRL. Created within the storyline by "Judith Jay," it's seen as a merchandised property throughout the series, as kids have packpacks, posters, T-shirts and other merchandise featuring "Wilfred," its goofy red stuffed animal. Watch it take on a life of its own! You can contact us on Facebook and on Jinky's website www.jinkycoronado.com! The amazing adventures of everyone's favorite Asian schoolgirl!